The fashionable bars in the neighbourhood where I’m staying in Brooklyn are almost uniformly decorated in vintage tiles and aged wood, with exposed bulbs lighting kitsch memorabilia. There is an unmistakeably worn feeling to the materials and objects fashioning these spaces, designed to evoke a wistful nostalgia for some general moment in the not-too-distant past: generic history as a marker of authenticity. 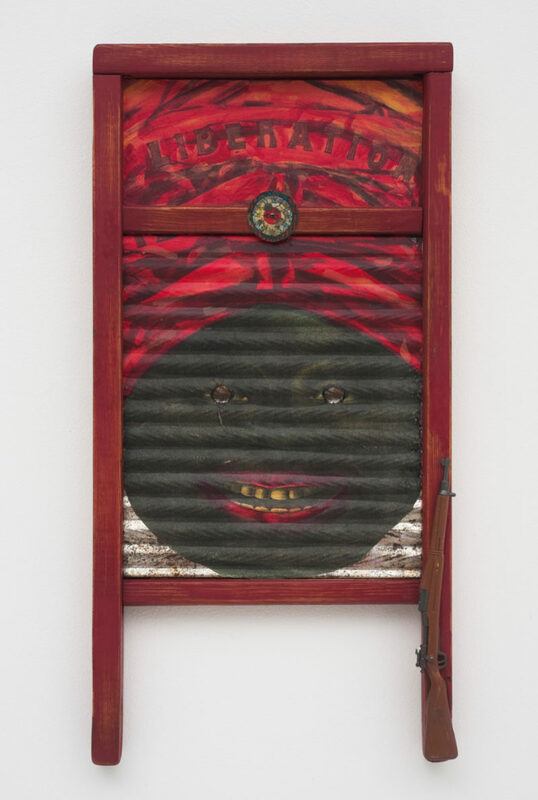 There’s a similar aesthetic to the vintage washboards, advertisements and muted reds and ochres that colour Betye Saar’s assemblages in Keepin’ It Clean, although the resemblance is merely superficial. Saar’s found objects and materials are weighted with history, and serve as a poignant reminder of how African American subjects are denied such sentimental relation to the past. Across this modulated series of artefacts, history emerges as a living, breathing, forceful entity, and its conditions of extraordinary violence and subjugation are understood in critical relation to continuing racial inequalities of the present. The exhibition concentrates on a sequence of assemblages Saar began making in the late 1990s, using her collection of vintage washboards as its foundation. An insistent repetition draws out the significance of these obsolete cleaning devices as objects symbolically drenched with the sweat of the poor, black women who used them. 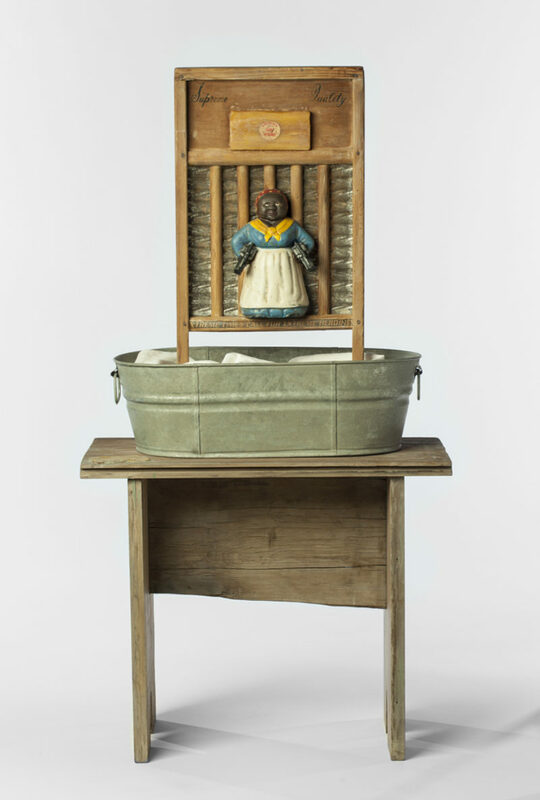 Domestic and military items recur across Saar’s tactile creations—worn soap bars, bullets, miniature guns, and mammie figurines—redolent objects marked by gender, class and race. Historical photographs of black men and women are often pasted onto the wood or metal ridges of the washboards and are consequently tricky to grasp. The images move in and out of focus, the ridges acting like static on a radio station, suggesting the distance of history and the forgetfulness of passing time. In this iteration of the exhibition the objects are dramatically spot-lit and mounted, appropriately, on watery blue walls of varying shades. There are many powerful moments in this precise, one-room display. The racist POWDER advertisement atop a small table, quite simply scratched to read POWDER; a white lace christening gown delicately stitched with racist slurs. Together these tableaux serve as a reminder of how language and representation can stitch us up. ‘I’ll Bend, but I Will Not Break’ (1998) consists of an ironing board and white sheet; yet up close it is shockingly apparent that the iron is manacled to its board and the white sheet embroidered with the letters KKK. Violence bubbles dangerously beneath the domestic arrangements. A diagram of a slave ship is also printed onto the ironing board to indicate the extent to which the Middle Passage and extended domestic servitude were complexly and painfully interwoven long after the abolition of slavery. ‘Standing in the Shadow of Love’ (2000) neatly employs a diptych format to consider the broader affective requirements demanded of African-American servitude. On the left, a basic washboard is decorated with stitched quilting in muddied tones, a painting of a windowless wooden home, and the image of a black man with his two young children. On the right, a glazed window-frame is dressed with lace and flowered wallpaper, providing a dainty border for the photograph of a black nanny and her white charges. One of the children holds a pale-haired doll, while a dark shadow gapes in the family portrait on the left where the mother is missing. The contrast between the two panels couldn’t be clearer, as Saar underscores the sorrowful ‘labours of love’ required of black women working in the kitchens and nurseries of white families. The assemblage’s title conjures a refrain from the 1960’s Motown hit and, by invoking that revolutionary decade, adds texture to lingering feminist clichés that assume care within the nuclear family to be the dominant repressive force in all women’s lives. The figures in Saar’s emotive memorials are certainly not, however, only downtrodden or suspended in history; she arms her subjects with revolutionary weaponry, slogans, and fists raised in protest. 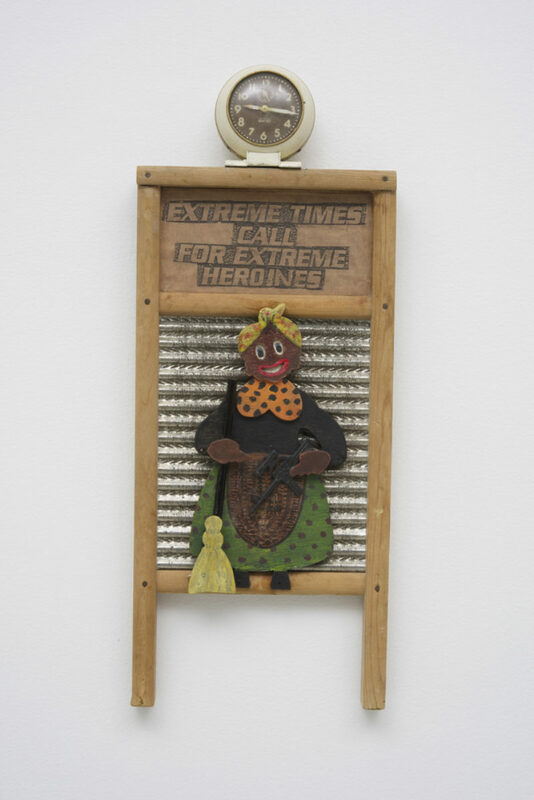 One washboard declares: ‘EXTREME TIMES CALL FOR EXTREME HEROINES’. Heroic female characters abound—an Aunt Jemima figure holding alight both a broom and gun, or two figurines resting guns across wash-buckets that look like pregnant bellies—as recognition that any revolution has to integrate the domestic and public, feminine and masculine spheres of labour. In more recent washboard assemblages, Saar turns her attention to images of male blues musicians and she places these against slave-ship diagrams and racist banjo-playing stereotypes. The ridged washboards may serve to formally distance Saar’s chosen images, but against these diagrams the ‘waves’ also summon the spectre of water and ships. The inclusion of works such as ‘Birth of the Blues’ (2015) recognises the ways in which the construction of a public African-American masculinity has been interwoven with music and entertainment, much as femininity has been with the domestic sphere. Here, the political significance of the washboard is especially sharp and, as both laundry device and musical instrument, allows Saar to weave these histories together. Saar has attributed her current attention to male imagery to the highly publicised and protested police killings in America and the emergence of activist groups including Black Lives Matter. Using historical materials to query sentimental and jingoistic relations to the ‘greatness’ of the past, Saar exhorts the nation to ‘clean up’ its act. The artist’s career-long focus on household objects and consumer imagery demonstrates, clearly, how images have served specific political purposes: namely to perpetuate myths of racial hierarchy that sustain systems of black exploitation. Across town, at The Brooklyn Museum, Saar’s most famous artwork, ‘Liberation of Aunt Jemima’ (1972), is on display at the vast survey exhibition ‘Soul of a Nation: Art in the Age of Black Power’ (until 3 February 2019). While this sweeping survey is distinct from the precise display at New-York Historical Society, it likewise suggests the dispiritingly renewed relevance of black artists’ politically charged works. As Keepin’ It Clean curator Holly Jerger points out, the washboards take on a new urgency in current contexts: ‘Saar reminds us that the most important cleanliness is of the heart and the conscience. Our personal beliefs and actions are more crucial than ever as the American government and its institutions of power slide back into overt racism and sexism.’ Saar’s powerful and affecting assemblages maintain black representation as a necessary site of political struggle. The recurrence of clocks throughout the exhibition serves as a reminder that, while time may have passed, the stains of history cannot be simply washed out and forgotten—as the nostalgic commodification of history would have us believe.